Kids desperate to drive, but who can’t yet reach the pedals, can soon take to the road as Peugeot teams up with Alton Towers, the award winning theme park in Staffordshire – to offer the under 10s the drive of their life! 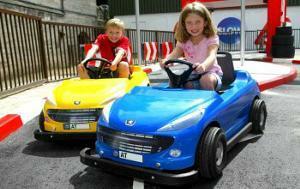 Opening in mid July and representing an investment of over £1 million, the Peugeot 207 Driving School attraction will enable young drivers to experience many different elements of modern driving in miniature electric versions of the brand new Peugeot 207. Young drivers will be able to choose their own route whilst getting to grips with everyday obstacles like traffic lights, roundabouts and cross roads, all with a quirky edge; take a trip to the bubble-blasting car wash, stop for the lollipop lady if she hasn’t already melted in the sun and watch out for the tricky gigantic hedgehogs rambling over the zebra crossing! Budding racing drivers can also test their skills in a special section within the attraction – the ultimate slalom challenge. And if the young drivers are too eager to wait until they are old enough to hit the roads, they can have their very own Alton Towers driving licence!